Knowing your Heart Rate Variability (HRV) is like knowing how fast is your computer’s operating system. You want a fast operating system on your phone or your laptop…click or tap something and you want INSTANT results. Well, your body has an operating system, too, and it’s called your Autonomic Nervous System. If something in your environment changes or you are exposed to a stressor (bacteria, extreme temperature, hungry tiger, spoiled food, child sneezing on you), you want your body to instantly recognize the threat and take appropriate action. When your HRV is high, your body’s Autonomic Nervous System is receiving input from your environment, inside and out, and reacting quickly. A low HRV is a sluggish response to changes in and around you, which is not as healthy of a response. The other component of the HRV test we do at Bergen Family Chiropractic, is the balance of Sympathetic (aka Fight-or-Flight System) and Parasympathetic (Rest, Heal, Digest, and Breed System) activity. The Fight-or-Flight/Sympathetic system is like putting the gas pedal to the floor, all systems go for fighting or running. It is very wearing on your body and mind if you live this way all the time. The Parasympathetic nervous system’s job is to apply the brakes after a stressful situation and return you to a resting state where all the good things happen – eating, digesting, “breeding” activity, higher cognitive thought and decision making, immune system working well, hormones being made, and a calm state of being. How is Heart Rate Variability different from Heart Rate? Heart Rate is a simple average of the number of times your heart beats in a minute. For example, your heart rate may beat 60 times per minute but that number doesn’t tell you whether each beat was one second or an average of 1.5 seconds, .5 seconds, 1 second, etc. Heart Rate Variability (HRV) measures the specific changes in time (or variability) between successive heart beats. Generally, a low HRV indicates that the body is under stress from exercise, psychological events, or other internal or external stressors. Higher HRV (or greater variability between heart beats) usually means that the body has a strong ability to tolerate stress or is strongly recovering from prior accumulated stress. 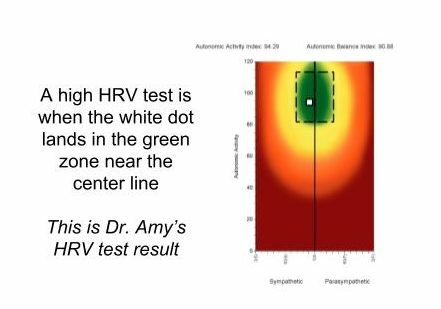 The HRV test is an assessment of your overall Autonomic Nervous System health. It is a great tool for looking at your health, how well you handle stress, and the resilience of your nervous system. We are pleased to offer this test as one of the three digital neurological assessments we perform on all new Practice Members during their first visit examination.